If you’d like to move beyond the obligatory tie and/or grill tools gifts for Father's Day this year, here are some ways to tell Dad you love him in an experiential ways. Whatever you choose to do, adopt the idea that you’re willing to do something with him –something he’s interested in! You’ll make memories both of you will treasure forever. Car Dad: It’s stereotypical to assume your dad is a car guy, but if he is, there are all kinds of ways to give him a special treat. Try renting a vintage car and take him for a long drive (don’t forget to let him drive!) or have his beloved car detailed for him. Take him go-cart riding, or just drive out of town to have a picnic. Art Dad: Chances are there’s an art museum around with something interesting for the two of you to go view. If not, maybe he’d be interested in learning to paint through an art class sponsored by the local community college. Go on; take it with him! Cooking Dad: Maybe it would be fun for Dad to take a cooking class with you. There are even people who will come to your house to teach it, or you can go to a local restaurant or culinary school. Pick a type of cuisine Dad will enjoy –no need to learn a vegan curry if your dad is all about the bacon. Gardening Dad: Plant a garden with your dad for the sheer joy of spending time with him and the added bonus of growing your own vegetables and herbs. As a variation on this theme, if Dad is getting older, coordinate with your siblings and other extended family to do his lawn work for the rest of the summer. Create a SignUp at SignUp.com with the dates and jobs and allow relatives and friends to sign up 24/7 from their smartphones or computers. No need for you to keep everyone on task, SignUp.com sends out automated reminders and provides real time eCalendar syncing. Volunteer Dad: If your dad enjoys giving back, he’ll probably love a chance to show you what he does and have you join in. Work in a soup kitchen or building a house for the poor. Travel Dad: Plan a road trip, or if budget allows, explore a new country together. Research and plan an itinerary for some place he’s long been interested in. Document with pictures and make a scrapbook to commemorate this once-in-a-lifetime excursion. Thrill-Seeking Dad: If Dad is into a little risk taking, take him to an amusement park and ride all the rides with him. Or go to one of those places that simulates what jumping out of an airplane is like. Or (gulp) actually take him skydiving! Music Dad: Attend a concert with him, or give him season tickets to the symphony. If that’s not an option, give him a gift certificate for music lessons on his instrument of choice. Sports Dad: If you stopped watching sports with your dad the second you moved out of the house or were old enough to say no, it’s time to try it again. Get tickets to a local sporting event—pick a sport that your dad follows or one that is new to both of you. Spa Dad: I know, I know, this is not every dad’s cup of tea. But imagine giving dad the experience of being pampered. Most men have never had a manicure or pedicure, much less a massage. If you are lucky enough to belong to a big city with a large Spa Palace, treat dad to the experience of sitting in saunas, and the ice bath and hot tub. 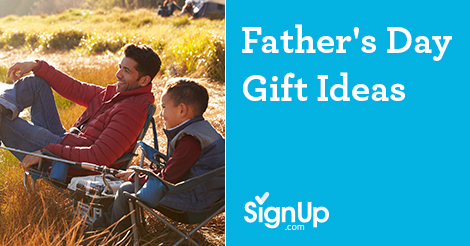 You don’t want to make him uncomfortable, but if he’s open to the idea, it’s a lovely way to spend time with your dad while getting a little pampered yourself. Need more ideas to help you celebrate Summer? Check out our Summer Activity Planning Center.